Hang your tools, gear, house and garden equipment etc. The Stud Grabber (TM) instant storage clip mounts in seconds and involves no hardware. Simply pull prongs apart and clip on to any exposed stud or support beam; it can be clipped on vertical, horizontal, and angled beams. It supports up to 25 lbs and can be used to hang extra tools and supplies in the garage, shed, attic, closet, construction site etc. 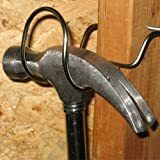 The amazing thing about this Utility Hook is the more weight you add the better it grips the wood or beam. Although this hook is meant to be temporary, it can serve as a permanent storage device. Use it for hanging tools in the workshop, organizing garden supplies, storing hoses, pool accessories, toys, baby carriages, and sports equipment to name a few. The Stud Grabber (TM) is approximately 2.5″ wide x 5″ long.